A few years ago, I traveled to Italy for the first time. I’ve loved pizza my whole life and was excited to try real Italian pizza. After spending a few days in Switzerland, my husband and I took a train trip through the Alps and into Italy. The first stop was the very clean and stylish city of Milan. 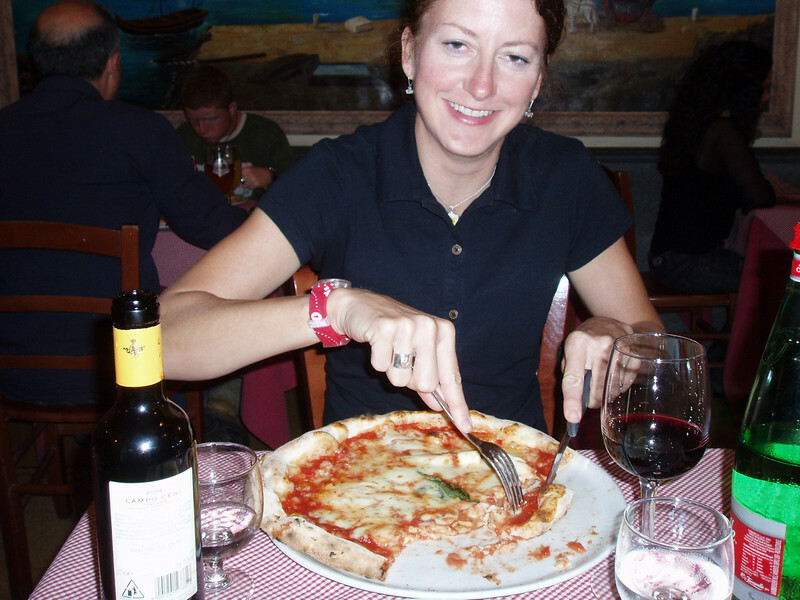 I ordered pizza Margherita my first night in Italy. It was quite wonderful. What’s not to love about this pizza: firm but moist crust, fresh mozzarella, tomato sauce and fresh basil. We heard that the best pizza comes from Naples and that we shouldn’t waste time eating the pizza from anywhere else in Italy. Wow! 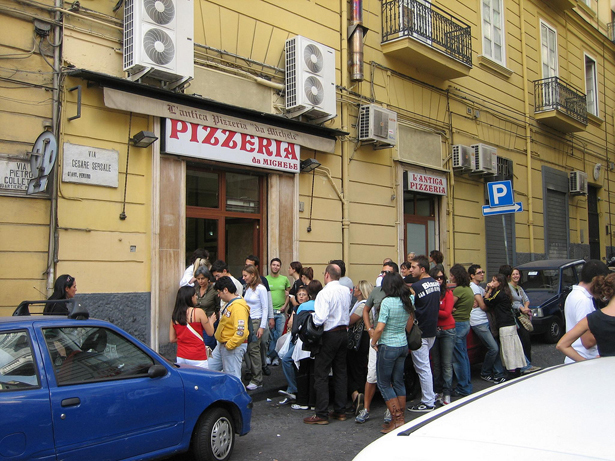 How could the pizza be any better than the pizza in Milan? I was anxious to find out. After leaving Milan we headed down to Naples to visit my husband’s business associate and friend Clemente de Rosa. Naples – Napoli in Italian – is Italy’s third largest city, a coastal port that lays at the foot of Mt. Vesuvius. We arrived at the train station and even though our hotel was within walking distance from the train station our friends insisted on picking us up in their car. They were locals but felt that the train station wasn’t safe for tourists. Clemente wanted to protect us so he asked to see my husband’s wristwatch. Bob was wearing a $350 watch (which is expensive in my book.) Our friend looked at his watch and told us not to worry since the thieves wouldn’t want it since they were going after Rolexes. This was not a good first impression of this city. Naples was different than Milan. Naples is a frantically hectic city. The traffic was utterly chaotic. It’s home to Italy’s cruelest and most powerful Mafia organizations, and a huge trash collection problem resulted in bags of garbage piled on the sidewalks next to the street. It is a dirty, stinky, uncivilized city. Even Clemente said so. In Dante Alighieri Square, the memorial statue to one of Italy’s greatest writers is covered in graffiti, which might be poetic justice since “graffiti” is an Italian word. Last year the Margherita was officially recognized as the “real Neapolitan Pizza” by the European Union and was given the coveted TSG (traditional specialty guaranteed status by Brussels). In order to qualify as real Margherita, the pizza must be made from durum wheat flour, fresh yeast, water and sea salt, with a topping of olive oil, San Marzano tomatoes, and mozzarella made from buffalo milk. Buffalo mozzarella from Italy is made from domestic Water Buffalo milk and not from the milk of the Buffalo or Bison as we call it here in America. During our stay in Naples, I ate pizza every chance I could and it was everything they said it would be. One evening, walking back to the hotel, our evening entertainment was standing at the corner and watching the traffic flow of the people, cars, buses and Vespas. It was amazing that nobody crashed. If it wasn’t for the pizza in Naples I’d probably never want to go back. Back home, I craved real pizza from Naples. We decided to try to make it ourselves. We told Clemente what we were doing and he told us that it’s the water in Naples that makes the pizza. I didn’t want to drink the tap water while in Naples I’m definitely not going to pay to have water from Naples shipped to Boise just for pizza. Our tap water will just have to do. We don’t have a wood burning stove but ans outdoor gas BBQ works just fine. 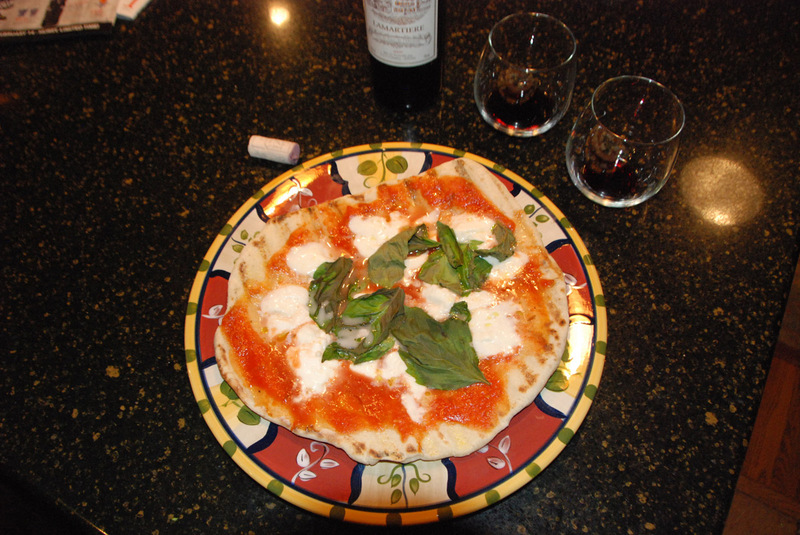 After research and trial and error, the following recipe is the closest to real Naples pizza Margherita I could duplicate. I use fresh pizza dough from Winco. For you Boise folks, it’s located near the cheese section. It you can’t get to Winco, any pizza dough recipe found in your cookbook or this Naples pizza dough recipe works great. Put all above ingredients into blender and pulse for just a few seconds to puree the tomatoes. The sauce recipe makes enough for two large or four small pizzas. I found it at Costco at a great price. I have a love/hate relationship with that store and hope they don’t stop selling it. Buffalo is the best but if you can’t find it fresh mozzarella from cow’s milk will just have to do but it won’t be the same. Chop mozzarella into small one inch pieces. When grill is hot, slide pizza dough onto grill and shut lid. Grill for about 2 minutes or until the bottom is starting to brown. Flip over then quickly spread a thin layer of sauce, cheese, about two tablespoons of olive oil and a few pieces of basil. Shut lid and cook until cheese starts to melt and the other side of the dough is starting to brown. Remove from grill and eat immediately.